I used to live in an apartment where wolf spiders the size of your palm used to visit. The big ones would always have gray bodies and black legs. They were so big that when they ran along the kitchen counter, they actually produced audible footsteps. Just hearing that story freaks me out. Sheesh. OMG, Anon, the same happened to me in an apartment we used to live in. It was in a foresty area and INFESTED with all kinds of spiders. In our bathroom, we had a long black carpet. I walked the length of it to the sink, turn around to go back out and there was a huge HUGE grey wolf spider (like you said, about the size of your palm). I am a complete arachnophobe (never go near them in pet stores, I get goosebumps and shake). My husband said I screamed really loud and he found me trying to curl up in the corner of the wall. We only lived there a year but had to move. There were various spiders, huge crickets that jumped on your face in the middle of the night and our front door was infested with hundreds of daddy-long-legs. To me, that was the apartment from hell, but a spider enthusiast's dream. RW - that's just NASTY. Seriously. OMG!!! I have ones that are just a bit larger than a quarter and that is big enough for me. Although I don't have a phobia about them, I do love when the dog catches them and plays with them until they are no more. She loves to chase them around and then pounce on them! 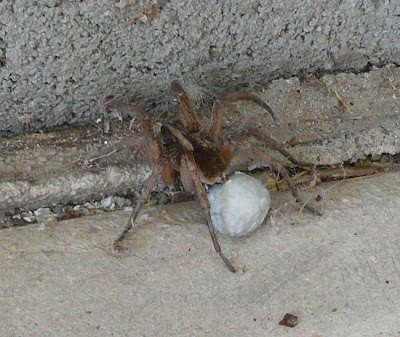 I found a spider that I think is a Wolf Spider but the Sac was brown I was told it was a hiloramandous flat tail spider how can I find out?